HOUSTON — Launching a mission to another star could teach us not just about space, but about Earth as well, experts argued here today at the 100 Year Starship Symposium. "I believe space exploration is a human imperative," said Mae Jemison, the first female African American astronaut. "It didn’t begin in 1957 with Sputnik, it's been a part of us" all along. Jemison is heading the 100 Year Starship initiative, which aims to mount a mission to another star within 100 years. Toward that end, scientists and thinkers from a variety of disciplines gathered for a public symposium here from Sept. 13 to 16 to discuss the motivations, challenges and possible solutions for pursuing interstellar spaceflight. "I'm excited for the opportunity we have to pioneer tomorrow's technology and to reimagine our future," former President Bill Clinton, who is the symposium's honorary chair, said via a video address today (Sept. 14). "I only wish I could be here 100 years from now to make the trip." Because the nearest star is more than 4 light-years away, the fastest spacecraft ever built, Voyager 1, would take 75,000 years to get there. 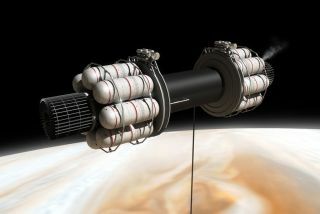 A realistic mission to another star system will require novel propulsion methods, as well as new life support, habitat technology and social structures to support what could be multiple generations of astronauts making the journey. "We need the full capacity of the people we have on this planet to figure out how to do this," Jemison said. She also stressed the importance of outreach to involve the public in the project. "I know that we would be on the moon right now if we had kept the American public involved. They didn’t leave us, we just left them out. We have to change the idea that space is just for rocket scientists, and nowadays billionaires. It's actually for everybody." The payoff of such a mission could be felt not just in space but on the ground, she said. For example, one of the leading ideas for how to power a starship is nuclear fusion propulsion. Since fusion is also a potential way to create energy on Earth, the process of inventing such a technology for spaceflight could have applications for our planet, too. "Just the mere idea of going might transform life on Earth right now," Jemison said.